Peace to All Beings: Should religion or spirituality play a role in how we eat? Should religion or spirituality play a role in how we eat? Good News: The Lawrence (KS) Journal World published an answer written by me to the question—“Should religion or spirituality play a role in how we eat? Why or why not?” It appeared in Saturday’s paper 9-21-12. Thank you, Lawrence Journal World, for the opportunity to share this message of kindness to all beings. “Should religion or spirituality play a role in how we eat? Driving down 6th Street I saw a bumper sticker that read “Lovingkindness is my religion.” Who can argue with that? At the root of nearly all religions, lovingkindness and nonviolence are the spiritual ideals. As people of faith, we hope to apply these ideals as best we can in all areas of our lives. But what about how we eat? If we want to eat with lovingkindness, then we must face the brutal and violent process that sentient beings endure before ending up on our plates. Very few of us have been on the killing floors of slaughterhouses or stood on the decks of ships that haul in thousands of suffocating and dying fish, turtles, dolphins, and others. So it is easy not to think about the animals themselves. Yet while you read this short article, millions of animals are being raised and killed in ways most of us could not bear to witness. Nevertheless, although we may not see them suffer--our souls hear their cries for mercy. 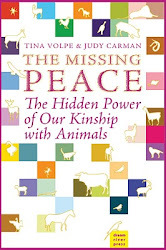 “Spiritual progress,” said Gandhi, “demands from us at a certain point that we stop killing our fellow living beings...” Schweitzer, St. Francis, Jesus, Einstein, Tolstoy, Rachel Carson, and many others have taught us that nonviolence toward all sacred life must be our aim. The nearly universal spiritual ideal to “love one another” requires us to embrace all beings, not just people, in our circle of compassion. As our faith grows, so does our desire to live by our highest ideals. When we stop eating animal products, we are no longer eating violence, and our hearts and souls can at last be at peace. We are here, not to destroy but to celebrate life and to love and care for all God’s miracles—all animals and all people-- who share this world with us. 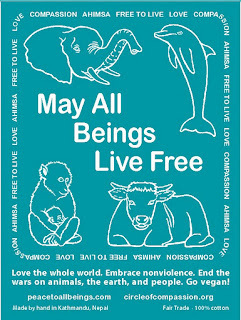 May all beings, including all people, be happy and free. I agree so wholeheartedly with you.